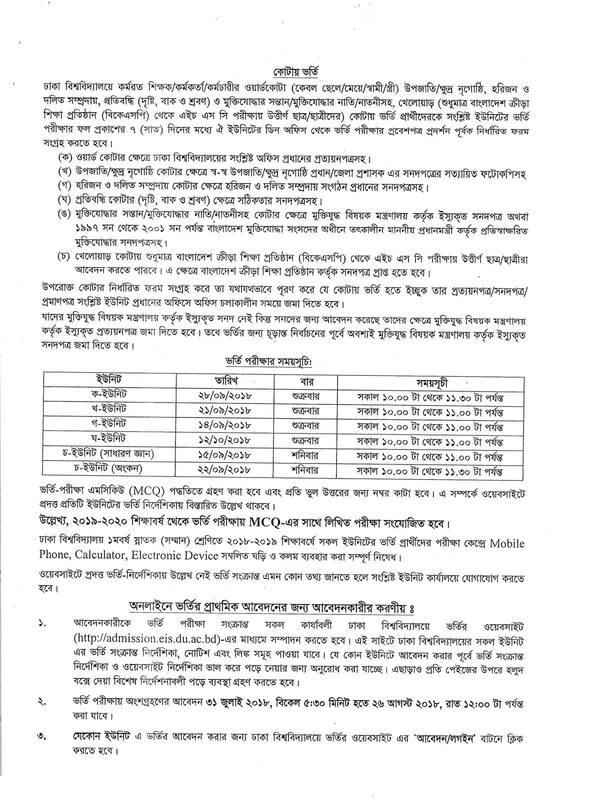 Dhaka University Admission Notice 2018-19 has been published. 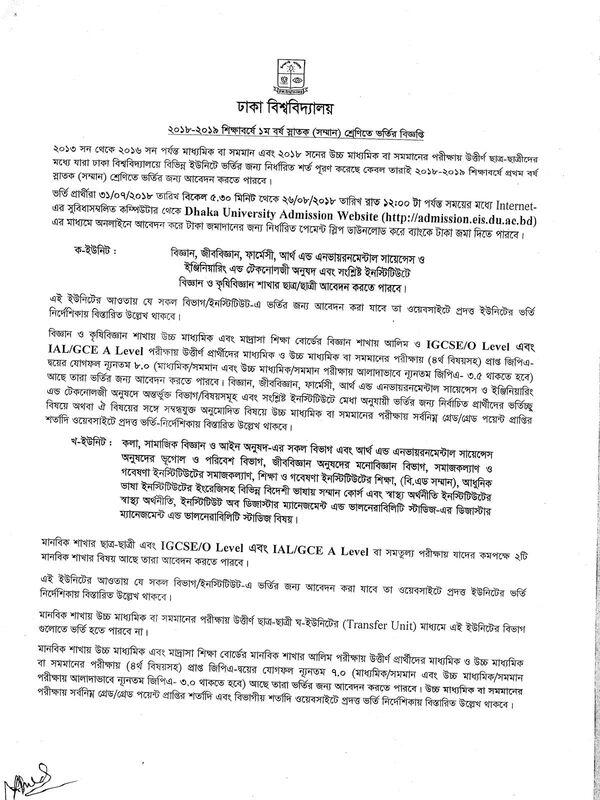 HSC Pass any student wants to first choose in Dhaka University. Interested candidates will have to apply in Dhaka University Admission Test circular 2018-19 by Dhaka University website official website at www.du.ac.bd & as well our website. Dhaka University Admission Committee has been divided into the five units such as Ka unit, Kha unit, Ga unit, Gha unit, and Cha unit. 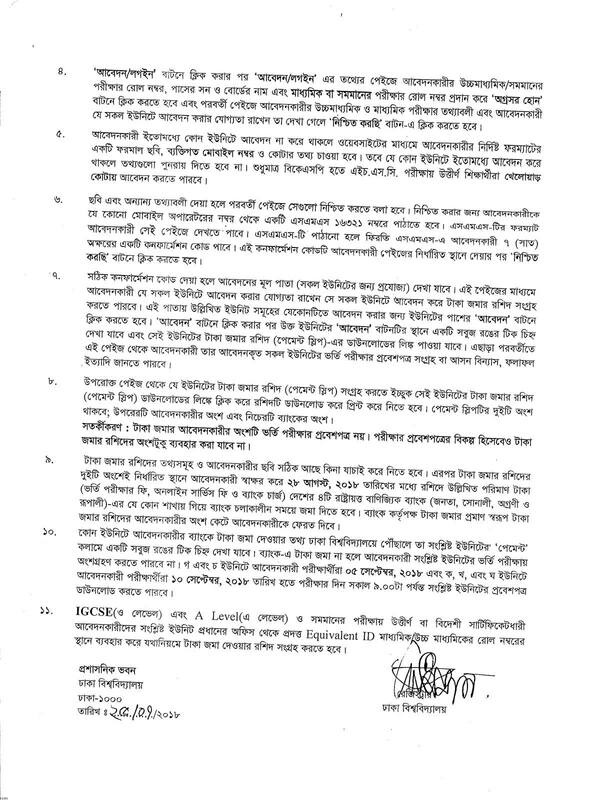 Dhaka University Admission related update information you can get my website accordingly. Exam topics: Only Science background students can apply in this unit. 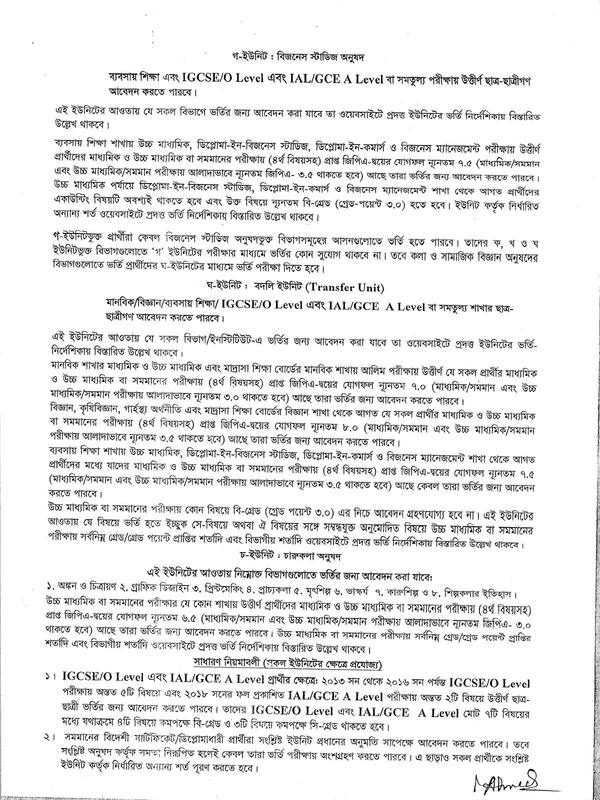 This Unit exam subjects – Physics, Chemistry, Math / Biology, Fourth subject / Bengali / English These 4. There will be a total of 30 questions – 120 questions from each subject. N.B: The admission test will have 120 MCQ questions, each of which is the value of 1. That is, 120 marks will be held and the total time is 1 hour and 30 minutes. Exam topics: Only Arts background students can apply in this unit . And the subjects of examinations – Bengali, English and general knowledge are three. In the admission test, there will be 100 MCQ queries, each question values carry on 1.2 marks. That is, 120 marks will be held and the total time is 1 hour. Each question will be deducted 0.30 from the number received for the wrong answer and the total pass mark 48. and every one have to pass individuals subject like for Bangla – 8 marks, English -8 marks and General Knowledge – 17 marks. Exam topics: Only Commerce background students can apply in this unit. In the admission test, there will be a total of 100 questions in 120 numbers. And 1 hour will be scheduled for the exam. The number will be cut for the wrong answer in the admission test. A correct answer number will be deducted for every 5 wrong answers. That means, for every wrong answer, 0.24 will be deducted from obtained marks. This number will deduct subject wise. Merit list will be based on a total of 200 Marks. 80 based on Marks SSC and HSC GPA. These marks are calculated by multiplying SSC GPA (with optional) by multiplying by 6 and multiplying by 10 with HSC GPA (with optional). The remaining 120 marks will be held in the MCQ system. For the MCQ examinations of 120 marks, a total of 100 questions will be answered and the time will be given 1 hour. The value of each question is 1.2. For every wrong answer 0.30 number will be cut. To pass the admission test, you will get minimum 8 marks each subject with total 48 marks.